The Bobcat® loader operator training course imparts rules and practices for safe operation of skid-steer loaders, all-wheel steer loaders and compact track loaders. It is NOT designed to license or certify operators as skilled or factory authorized operators. View an excerpt of the loader service operator training course handbook. Get a preview of the video content in the loader training course. 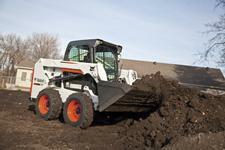 Discuss how weight distribution affects skid-steer loader steering and stability. Explain the difference between Tipping Load and Rated Operating Capacity. Have an understanding of the hydrostatic transmission, and that the loader will react the moment the steering levers are moved. Explain why maintenance is an important factor for safe, efficient, and productive operation. Identify the controls and their functions. Identify the loader's safety features and explain their importance. Explain the steps of safe entry and exit. Explain the reason for changing attachments and the use of the Bob-Tach system. Know the fundamentals of safe maneuvering, traveling, and working with the attachment. Know the fundamentals of efficient maneuvering, traveling, and working with the attachment.